We now turn to the "Highlights" decisions of last term that dealt with religion and the law. 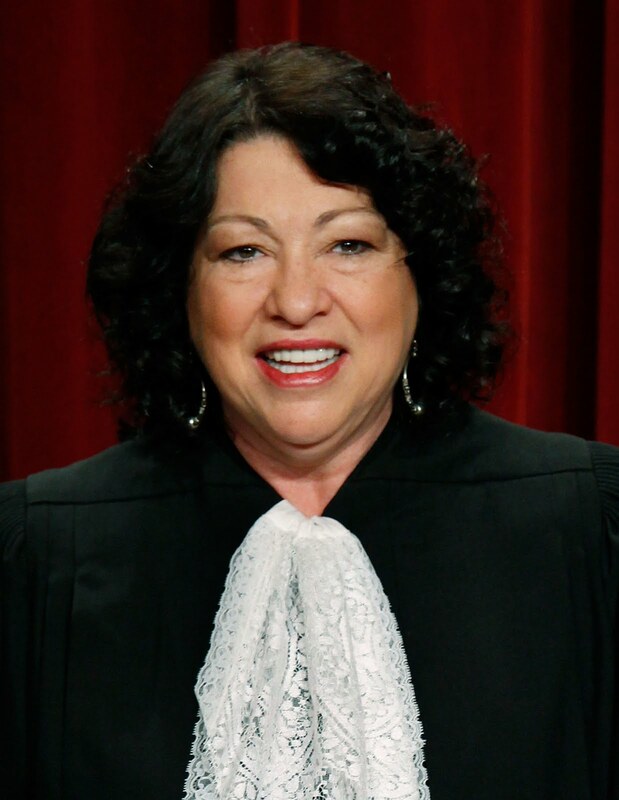 In the previous posts in this series on New York Court Watcher, we identified what, in my humble opinion, are the "Top Ten" decisions of the Supreme Court's 2009-10 year.We then took a closer look at the 4 of those 10 decisions that resolved free speech and related issues. 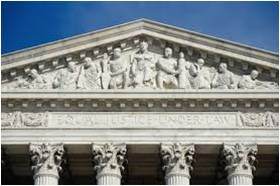 (See the several posts: Supreme Court: Highlights, Patterns & Implications from Last Term (Part 1), Sept. 29, 2010, through Supreme Court: Highlights...(Disclosure--How I Would Have Voted in the Free Speech Values Cases), Oct. 29, 2010.) In this post, we'll look at the 2 decisions among the "Top Ten" that involved questions of church and state. One of those decisions we've already discussed. It involved expressive activity and freedom of association and, therefore, was also included in the 4 free speech values cases. 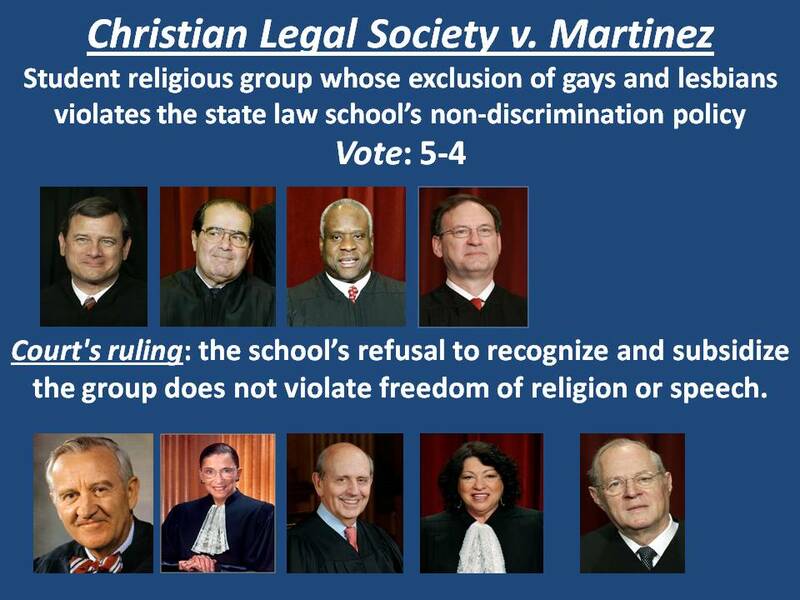 That's the decision in Christian Legal Services v. Martinez. As you may recall, that's the case where a state law school refused to recognize and fund a student religious group that excluded gays and lesbians from membership. The group's exclusion of gays and lesbian's violated the school's anti-discrimination policy. Stevens, Ginsburg, Breyer & Sotomayor--the 4 more liberal Justices--supported the school's enforcement of its anti-discrimination policy. 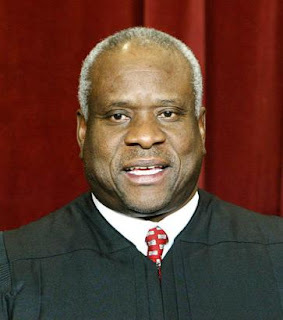 Roberts, Scalia, Thomas & Alito--the 4 more conservative Justices--argued in favor of the student group's claim for school recognition and funding. 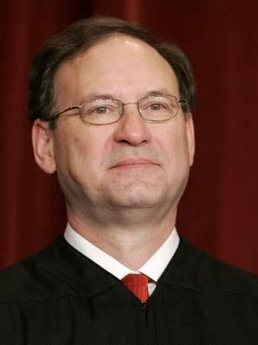 Justice Kennedy, who has typically supported equal rights for gays and lesbians, sided with the liberals and gave them a majority. 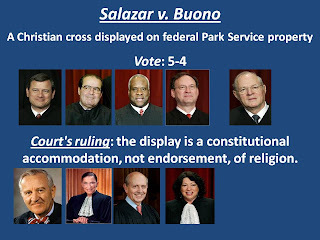 The other decision among the highlights that dealt with church-state issues was Salazar v. Buono. That was the case involving the Christian cross displayed on federal Park Service property. The display was challenged as a violation of the First Amendment's non-establishment mandate. The underlying facts include an effort by Congress to avoid the constitutional challenge by transferring the land in question to private ownership. The particular bit of land on which the cross was located would, then, no longer be part of the larger federal property. Presumably, in turn, the federal government could no longer be charged with embracing a religious symbol and what that symbol symbolizes. 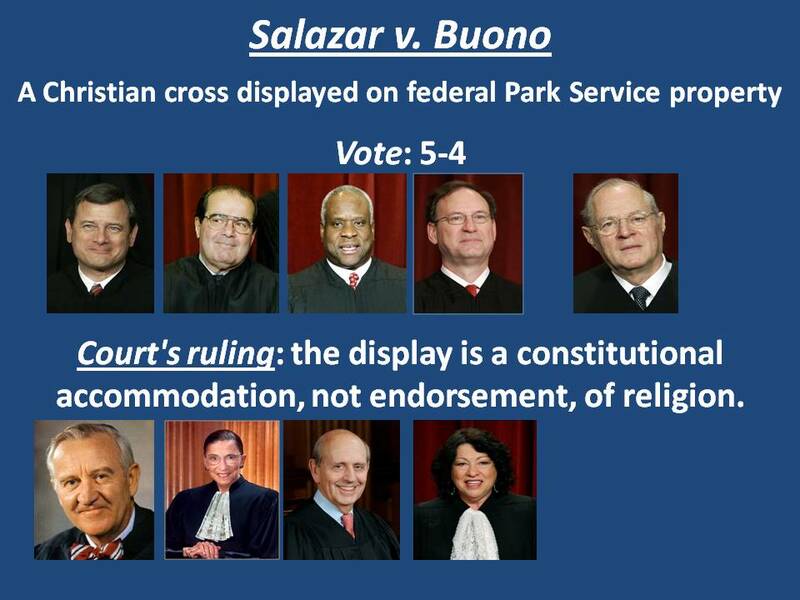 The Court, nevertheless, did address the constitutionality of the Christian cross on government property. Not surprisingly, it was deeply divided on that question. And not surprisingly, it was divided along liberal versus conservative lines. 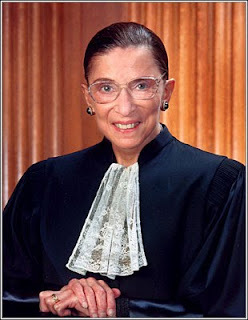 Stevens, Ginsburg, Breyer & Sotomayor--the 4 more liberal Justices--argued that the government was constitutionally prohibited from approving a particular religion (or any religion at all), and that is what the government was doing by displaying the cross. Roberts, Scalia, Thomas & Alito--the 4 more conservative Justices--had a different view of the case, variously discussed in 4 separate opinions. One thing seems clear, however. The 4 conservatives did not have a problem with the government accommodating religion or religious heritage in this case. 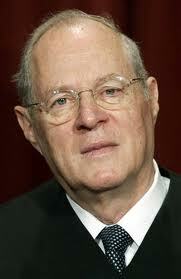 Justice Kennedy--as sometimes becomes a broken record--broke the tie. 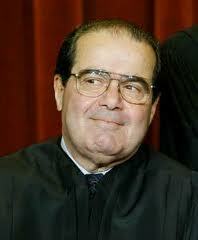 He sided with the conservatives and, in fact, authored the opinion for the Court. For Kennedy, the deciding point was that the display did not amount to an endorsement of Christianity. It was merely a recognition of the role religion plays in society. 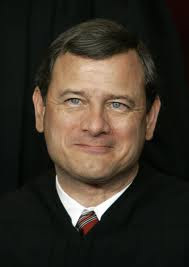 Chief Justice Roberts, and Justices Scalia, Thomas, and Alito sided with the fundamentalist religious group against anti-discrimination protection for gays and lesbians. They also sided with the display of a Christian cross against a strict separation of church and state. Stated otherwise, they supported accommodating religion. Both the religious beliefs, association, and practices of a student group, and the religious heritage and culture of American society generally. So, they were protective of free exercise of religion; but less protective of non-establishment. Both positions being in support of traditional Christianity--and opposed to equal rights for gays and lesbians, and opposed to avoiding government involvement in religion. At the other end of the Court's spectrum, Justices Stevens, Ginsburg, Breyer, and Sotomayor sided with the state policy of equal treatment for gays and lesbians, and against the religious group. They also voted for a strict separation of church and state, and against displaying the cross. Stating their positions otherwise, they opposed accommodating religion. 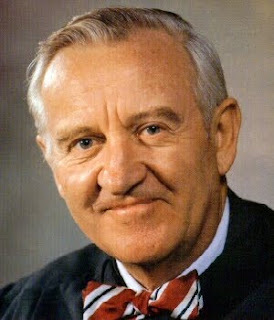 Whether it was a student group or society generally, the 4 liberal Justices opposed making an exception to non-discrimination policy or to non-sectarian government. So--as the diametric opposite of the conservatives--the liberals were less protective of religious free exercise; but more so of non-establishment. Both positions--again, as diametrically opposed to the conservatives--were in support of minorities. Whether it be gays and lesbians, or non-Christians and non-religionists who would be offended by the government's endorsement traditional Christianity. 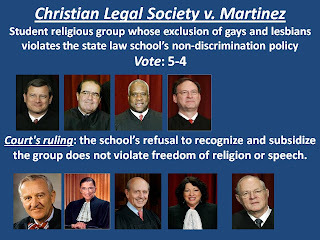 As for Justice Ken nedy--and since he was the tie-breaker, the Court itself --he sided with non-discrimination policy against the religious group, but with the display of the cross against a strict separation of church and state. So for Kennnedy and the Court, accommodating religion was rejected when that would entail government support of discrimination. But accommodation of religion was approved when it seemed innocuous and didn't necessarily reflect government adoption of particular religious beliefs. Stated otherwise, pragmatic rather than very strict application of the right of free exercise or of the mandate of non-establishment. It's no wonder that purists are frustrated with Justice Kennedy. He's much more flexible than the purists of either side of the Court's spectrum. (More malleable and unprincipled in the view of some of them.) It's also no doubtful proposition that the Court is deeply divided on church and state issues, just as it is on free speech and other ideologically contentious questions. 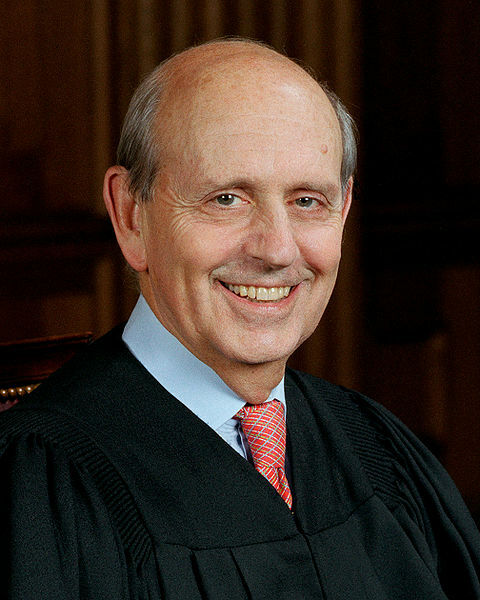 Nor is it a dubious proposition that the Court is as divided on these questions as is our highly partisan federal government and the electorate itself--i.e., we ourselves. In the next post in this series, we'll look at the Court's criminal law decisions from last term. Some very interesting and important rulings.